It’s time for Spring Admissions Tours at Loma Linda Academy! As you search for a school that best fits the needs of your family, please consider attending this fun and informative event! 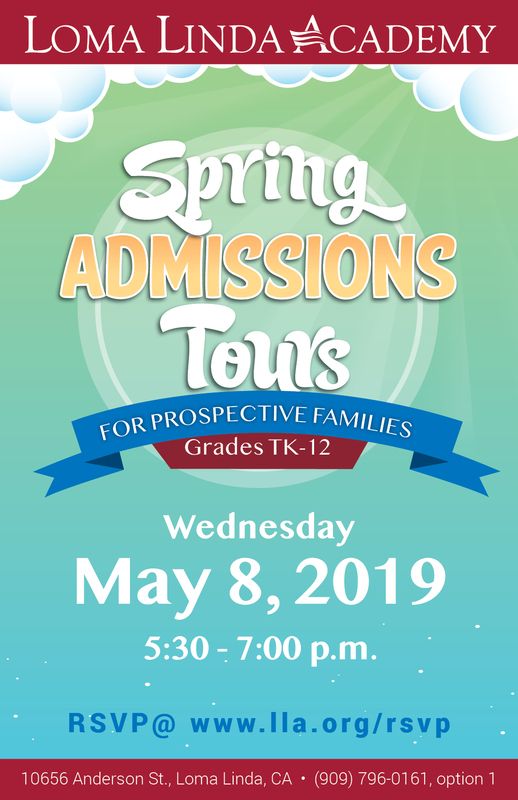 Prospective families interested in learning more about grades TK-12 are invited to tour the campus on Wednesday, May 8 from 5:30-7:30 pm. A light supper will begin at 5:30 p.m. in the Heritage Room on the high school campus. We will have an activity table for the kids, so feel free to bring your children along. You’ll have the opportunity to visit with our principals and learn more about LLA’s desire to provide a safe environment where students develop strong characters with Christian values. In addition, you will hear about our academic success, extra-curricular activities, active campus ministry, financial aid opportunities, and so much more! After this informative session, you will have the opportunity to join our principals on a tour around the campus. Our classrooms are filling up quickly, so please do not pass up this opportunity to learn what LLA could offer your family! To RSVP, please fill out the form below or call us at 909-796-0161, option 1.